a Norwegian student studying at an American institution who needs to earn more U.S. credit, but coming home to Norway this summer? an American/international student interested in earning U.S. university credit while studying abroad in Norway? Why not earn U.S. credits at the American College of Norway? At ACN’s summer school, students have the opportunity to earn up to six U.S. credits in four weeks in small, interactive classes taught by American faculty from the University of North Dakota. Exciting field trips have already been planned and American students are coming from all over the U.S. to join this exciting program! Don’t take only our word on how ACN’s summer school can help you supplement your credits and enhance your U.S. bachelor’s degree! ACN alumna and summer school participant Ane Louise Toft Rud had the following to say about our program. To earn U.S. credits, see the flyer below for more detailed information. If you have any questions, don’t hesitate to contact ACN at info@americancollege.no for more information and visit http://www.americancollege.no/apply/ to fill out the simple online application. Interested in Studying Abroad in Norway this Summer? 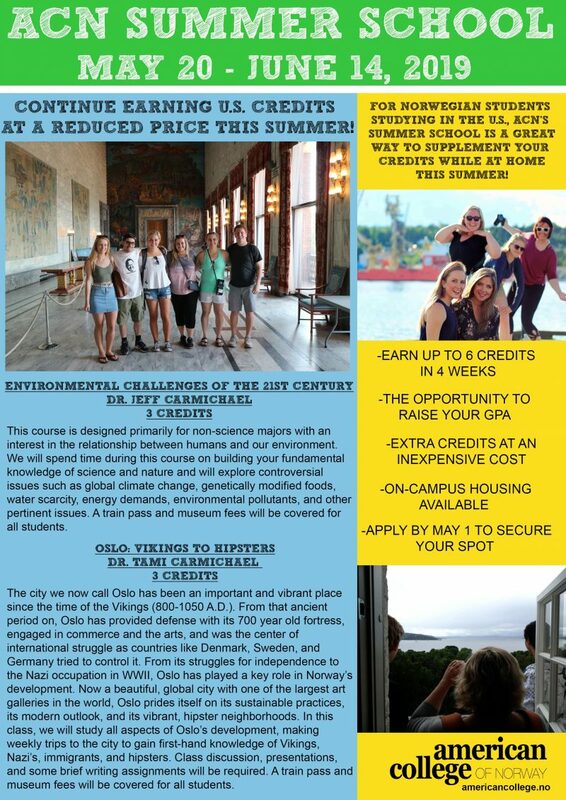 Join the American College of Norway's Summer School Program!